Originally Karachi was a small village made up of a cluster of fishermen’s huts on the three islands of Manora, Bhit and Baba. Due to it's location at the western end of the Indus delta the town has always been an important gateway for trade into central Asia. 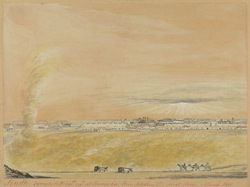 The British occupied Karachi during the First Anglo-Afghan War in 1839 and established a cantonment here. It was laid out separately to the 'Old Town' in a linear fashion; this area later became the basis of the 'New Town'.